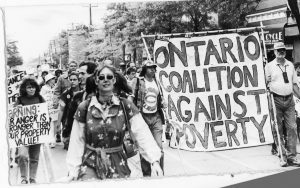 The Ontario Coalition Against Poverty is a direct-action based anti-poverty organization formed in 1990. We are based in Toronto but work on issues that affect people across the province and are in solidarity with similar movements across the country and around the world. 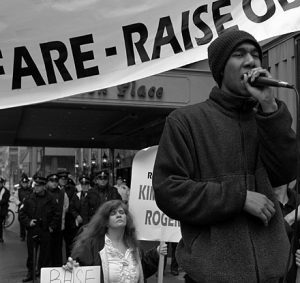 In addition to mobilizing people in resistance to government and corporate policies responsible for widespread immiseration and destitution, we also fight alongside individuals navigating social assistance, public housing and other bureaucracies, doing direct action casework to ensure people aren’t denied basic entitlements. OCAP works towards decolonization, in solidarity with and in defense of Indigenous struggles for sovereignty and self-determination. Simultaneously, we believe that in justice for immigrants and support the call for welcoming refugees, regularization for undocumented migrants, and the granting of permanent residency upon arrival. We will happily set sail the banksters, corporate executives, and their pawn politicians on a boat in exchange. We believe that poor and working class people can organize ourselves into a force that can put an end to the ruthless and reckless profiteering of the capitalist classes. Our fight is not limited to registering dissent, we fight to win. 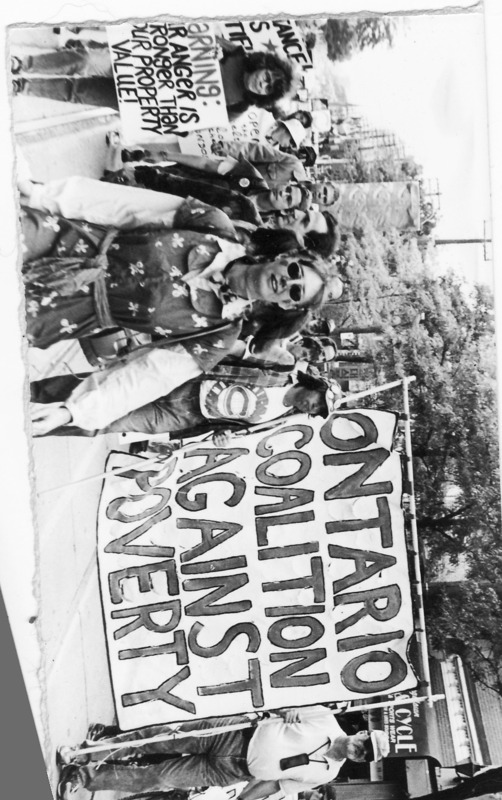 OCAP came out of a three pronged March Against Poverty in 1989 that saw people take to the highways in Windsor, Sudbury and Ottawa and march, over a two week period, on the Ontario Legislature in Toronto. Following this, plans were made for a founding convention of the Ontario Coalition Against Poverty that took place in November of 1990. At this gathering a vigorous debate unfolded over the orientation the organization should have. Two models were considered. The first would focus on lobbying and public education, while the second idea would be to work for a poor people’s movement that would use militant forms of social action to give the poor some power and capacity to resist. The second model was favoured by the majority of those present. As OCAP’s work got underway, we started to understand that, in order to build a base, while we would have to do all in our power to encourage resistance across Ontario, we would also need to root ourselves in a particular community. We chose Toronto’s downtown east, with its huge concentration of poor tenants and homeless people. We demonstrated the effectiveness of collective action not just by taking up campaigns and actions on broad issues but also by developing ‘direct action casework’ in order to win redress for individuals and families under attack by employers, landlords, immigration and the welfare bureaucracy. This enabled us to demonstrate that fighting back could produce results. 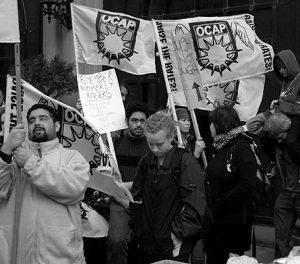 Over the years, OCAP has confronted a mounting agenda of austerity and social cutbacks. We began by challenging an NDP Government that had abandoned its progressive agenda and turned on poor people. In 1995, the brutally right wing Mike Harris Tories took power and OCAP was faced with a major cut to social assistance and an attack on the poor that had not been seen since the 1930s. We marched on the legislature, we resisted the implementation of workfare programs, we fought back against an explosion of homelessness and street deaths. Austerity deepened during those Tory years but OCAP’s resistance was also a defining feature of the period the Tories held office. In 1999, we set up a ‘Safe Park’ Tent City in Allan gardens to demand shelter. We took mass delegations of the homeless to the Federal Parliament in Ottawa. 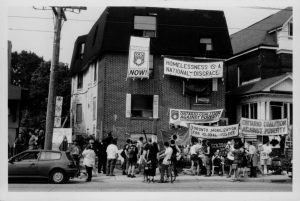 In June of 2000, we marched to the Ontario Legislature to challenge the abandonment of the homeless and faced a brutal police attack in what became known as the ‘Queen’s Park Riot’. We have held a series of squatting actions that have led to some victories. In 2002, we held a building Parkdale for some three months, it what was known as the Pope Squat. Social housing was created in two buildings at 88-90 Carlton Street, following OCAP squatting actions. Elected in 2003, the Liberals have played a crafty game of consolidating and deepening the Tory attacks on the poor, while pretending to be more progressive and caring. Under the camouflage of ‘poverty reduction,’ the war on the poor has intensified under the Liberals. We have challenged and exposed them, resisted their cutbacks and placed the demand to raise social assistance rates before them. When the Liberals took power in 2003, we intensified this struggle, demanding they act to address worsening poverty. In 2005, we began working to ensure people accessed the Special Diet Benefit, that enabled people on social assistance to obtain extra income if a medical provider deemed it necessary. We promoted knowledge of this benefit, organized clinics to sign people up for it and intervened on an ongoing basis to ensure OW and ODSP offices provided the income to those who qualified. Tens of millions of dollars went to poor people in this way. With a range of community and union allies, we have worked to build a Raise the Rates Coalition to fight for decent income. At this time, the Liberals are planning to keep people in poverty while they run a sham basic income pilot project. We are demanding that the nearly a million people on social assistance in Ontario get the additional income going to a mere 2,000 on the pilot. As we have fought at the provincial level over the years, we have also taken on Toronto City Hall. We’ve challenge the failure to provide shelter for the homeless, the neglect of public housing tenants and the willful denial of income to people in poverty by the City’s Social Services. During the period in which Rob Ford was Mayor of Toronto, we occupied both City Hall and Metro Hall and forced the opening of a warming centre. A lengthy fight, including a women’s occupation demanded a won 24 hour drop in space for homeless women and trans people. With John Tory as Mayor, we have slept out in front of his condo and taken other direct actions. We have stopped shelter cuts and continue to fight for better conditions for poor and homeless people in the city. OCAP has existed in period of worsening austerity but we have shown it is possible to fight to win, even in the face of such an agenda, and created a model of community based resistance that has won respect across Canada and internationally.